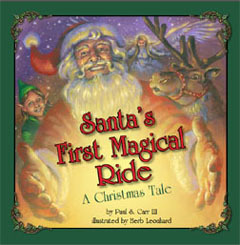 A new Christmas book, “Santa’s First Magical Ride” was just released by West Seattle residents Paul and Libby Carr, their 12 chapters of rhyming couplets augmented by world-class illustrator Herb Leonhard of Prosser, WA. Paul was the author, while Libby is marketing the book. The story offers an explanation of where Santa was born, why the elves live in the North Pole, and other answers that parents might share with their youngsters. Libby said the book’s 7” x 7” hardback format makes it well-suited for Christmas gifts for companies and organizations to give employees and customers. This is Leonhard’s 26th book. He has illustrated books ranging from “Lyrics by Tori Amos” to “Lewis & Clark in the Pacific Northwest Coloring Book”. The Carr’s of Alki are well-known, in part, for their work in establishing the new Statue of Liberty and Plaza there. Perhaps less known is that this creative duet adopted the Santa & Mrs. Claus persona for many a Christmas. “For over 10 years we both have done the Mr. and Mrs. Claus thing for kids,” said Paul, whose voice is heard on the CD, an entire reading of the book. He has done radio and TV voice work for years, and said the audio together with the text can be used as a learning tool for children. He belongs to an actual organization named”The Fraternal Order of Real Bearded Santas”. He began writing his self-published book about 10 years ago, and revisited it over time. Libby explained what compelled them to take on the subject matter of offering answers to hard questions kids have traditionally asked for years about Santa and his elves. Their book’s website answers some of the questions. According to “Santa’s First Magical Ride”, Santa was born on another planet called “Yule”. He was brought to the North Pole as a baby. On Earth, humans had threatened the elves for their magic, and they sought refuge at the North Pole. The book tells of a quest of trust among the factions. The book has 9,500 words of a layered history based on Nordic myth, imagination, and other sources. “I don’t know that we thought about this much before doing it but when you put these suits on you are all of a sudden a cherished and loved archetype,” said Libby, acknowledging a surprising responsibility that goes with the garb. The Carrs are available to appear as Santa & Mrs. Claus. or contact Libby Carr at 206-938-8721; libby@yulestory.com.